Update from ODM and OhioMAS. Yesterday, members of the BH Redesign Benefit and Service Development work group and Ohio Council received a communication from ODM and MHAS confirming the January 1, 2018 implementation timeline for the BH Redesign coding and rate changes based on feedback received from the BH Provider community. The next benefit and services work group is scheduled for September 13th. This means the BH Redesign coding and rates will be implemented in MITS and in MyCare Ohio plans on January 1st. It’s important to note that MyCare Ohio plans are included in this timeline. 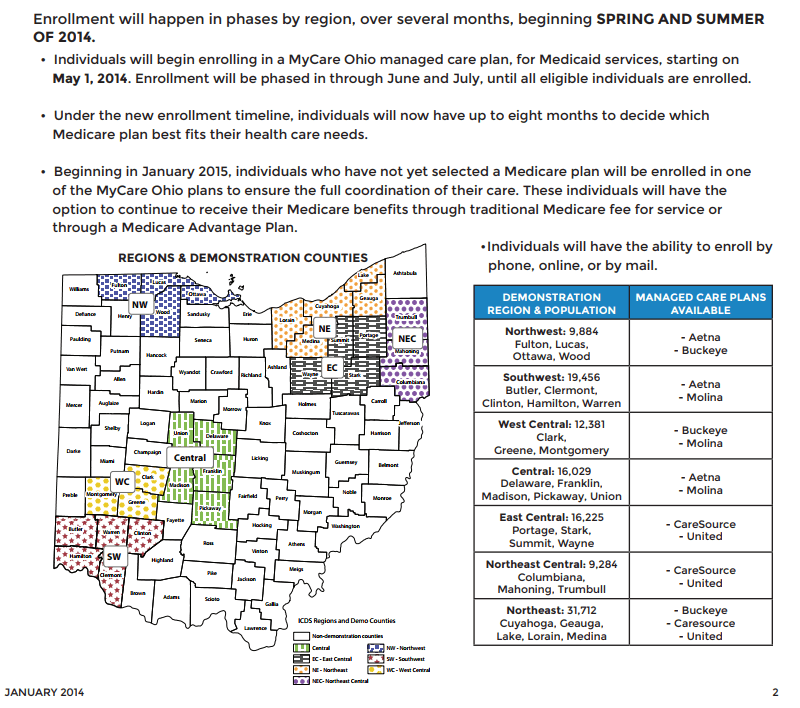 Below is a map showing the counties included in the MyCare Ohio areas. Remember, if you get clients from other counties, it will benefit you to contract with these agencies even if they aren’t in your area. IF you are in a MyCare area and aren’t contracted with the two listed plans, you may be routinely receiving denials for services billed direct to MITS or to the MyCare Plan without a prior authorization. For contact info for those MyCare plans, feel free to reach out to Behavioral Health Billing Solutions today. The Medicaid BH benefit will then transition to the Managed care carve-in on July 1st, 2018. This confirmation supports the two-step approach that allows providers to implement and use the new coding and rate structure for six months in MITS prior to transitioning payment to the five Medicaid managed care plans. ODM also confirmed that EDI file testing in MITS will be open for all providers from October 25, 2017 through November 30, 2017. The MyCare Ohio plans are accepting test files for BH Redesign now and will continue testing through December 15, 2017. MyCare Ohio participating providers are encouraged to continue testing with the MyCare Ohio plans. Providers are also encouraged to continue to engage in provider contracting and credentialing with the Medicaid MCOs and participate in any claims testing opportunities offered in preparation for the transition of the BH benefit to managed care in July 2018. ODM is developing a beta testing strategy that will measure claims processing across defined scenarios. Additional details about the ODM beta testing process will be provided at the next BH Redesign Benefits and Service Development workgroup meeting scheduled for next week. In addition, the schedule for the annual Ohio Council conference has been released. Dates are Thursday, October 19th and Friday, October 20th. To register for this conference, contact Brenda Cornett at cornett@theohiocouncil.org. Some of the sessions scheduled are critical to sharing information to ensure the success of both BH Redesign and the MCO Carve in. Registration closes in 40 days.